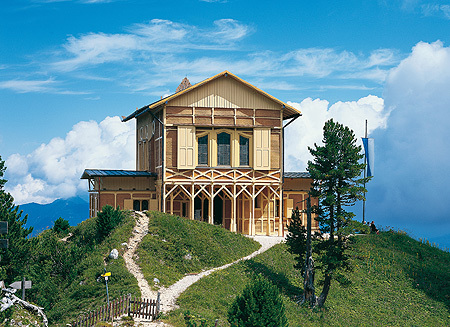 King Ludwig II started planning to build a house in the mountains in the Werdenfelser Land area in 1869. He chose the location as Schachen, at the foot of the Wetterstein massif, at an altitude of 1866 metres (6122 feet) – unsurprisingly, as it offers one of the most magnificent vistas of the high mountains to be seen anywhere in the Bavarian Alps. In contrast to the buildings erected by his father Max II, the house was not intended as a lodge for hunting – a pastime that Ludwig II firmly rejected. The building was intended to enable him to enjoy the high mountains while still enjoying every comfort. The exterior of the King’s House is based on the wooden ‘Swiss chalet’ type, which was popular for holiday houses among the nobility and wealthy citizens in the 19th century. The division of rooms, with a central salon, is similar to that in French upper-class villas of the period. The five residential rooms on the ground floor – with panelling of cembra pine and comfortable furnishings – resemble an Alpine holiday home of the time. In contrast, oriental splendour predominates in the Turkish Hall on the upper floor. It is based on a historic hall in the Palace of Eyüp, erected by Sultan Selim III in the late 18th century. Ludwig II, who had a strong interest in Eastern cultures, had seen a depiction of the hall in an English publication in 1840. Gilded, richly decorated walls, a fountain in the centre, elaborately embroidered stools and divans, a costly carpet, luxuriantly decorated accessories such as incense burners and candelabra, with light from large glass windows featuring colourful ornamentation, perfectly match the image of an Oriental hall of state. Ludwig II celebrated his birthday and name day here every 25 August. To perfect the impression made by the room, servants in Oriental costume were positioned in the hall, where they had to smoke hookahs and drink tea. Contrived scenes of this sort were in the tradition of tableaux vivants (‘living pictures’) that was very popular in the 19th century. 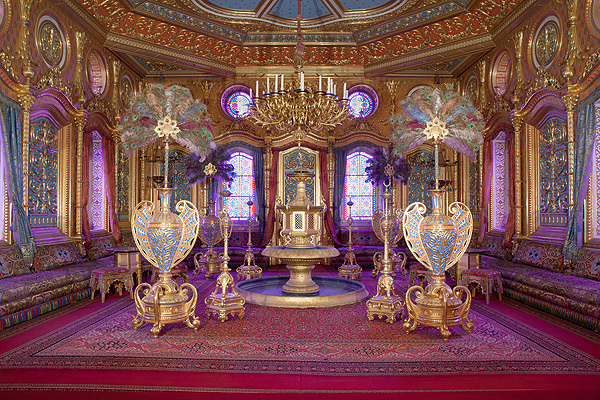 The 19th century’s enthusiasm for the Orient led to many creative forms of interior decoration, but this hall – in the midst of the high mountains – is unique and conceivable only with King Ludwig II. From the beginning of June until the beginning of October (depending on the snow conditions). We will announce the opening date here as soon as possible. The King's House is located 1800 m above sea level and only accessible on foot. The walk up and down takes 6 to 7 hours!